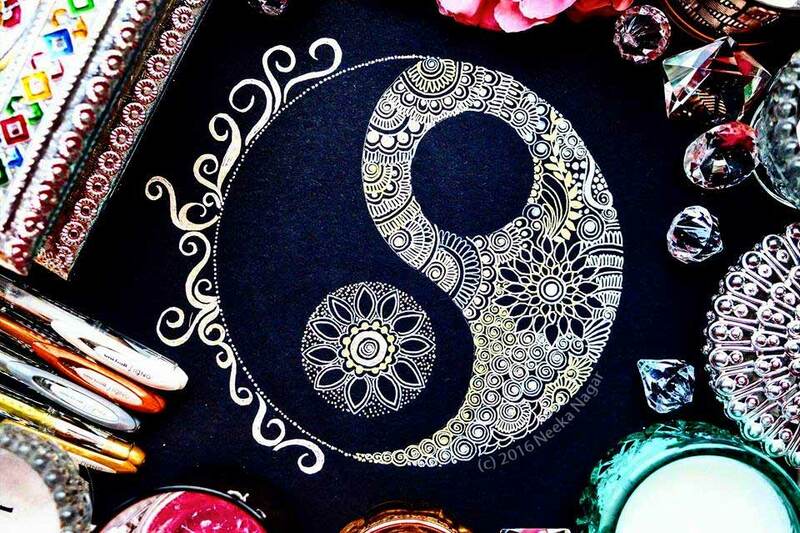 UK artist and designer, Neeka Nagar, of DesignsbyNN.com, hand drew her interesting and unique take on the traditional Yin Yang symbol using pen and ink on black card stock. Very cool! I like how she added the spiral flairs on the right to balance out the minimalness of the left side and the extreme patterned details on the right. I take inspiration from the world and my surroundings as do all artists, I look to nature and architecture for inspiration and all of these things touch my heart and flow through into every design I create. However most of the inspiration behind my designs comes from my Asian culture. The bold, striking patterns and colours of sari’s and the intricate details in Asian jewellery has a history spanning thousands of years, hopefully I can add my little bit to that history.